I’d start typing, then stop, because it felt like there was a veil shrouding my vision and obscuring the computer screen. I couldn’t see the sentences properly, I couldn’t hear the rhythm of the language, I didn’t understand the nuances of the words. I had no voice. I couldn’t tell if the result was good or bad, but I always suspected it was bad. I wasn’t even trying to write poetry or award-winning prose — all I was trying to do was write clear and correct sentences that would convey whatever simple idea I wanted to express. People often talk about the fog of war. I wouldn’t presume to know exactly what that feels like, since I’ve been fortunate to be spared the trauma of living or working in a war zone, but the phrase is evocative. What I felt I was experiencing was the fog of living abroad. I didn’t realize how paralyzing that would be, right in the middle of my career, until it was already happening. It wasn’t as if I didn’t know English. While growing up in my home country of Finland, like many citizens around the globe I’d started studying English even as I was still mastering my mother tongue. For Americans and other denizens of English-speaking countries, it takes no extra effort to express oneself in English, the lingua franca of influence and power today. For the rest of us, acquiring English is an additional task we must take up early if we hope to become global citizens. I’d embraced the challenge in third grade, and it wasn’t long before I was supplementing my English lessons with careful self-study of Bon Jovi lyrics. During high school I spent a year in Australia as an exchange student, and kept up my English on international backpacking tours in the summers, including a tour across the U.S. And by the time I’d started working at the American magazine, I’d already spent two years dating an American man with whom I spoke English all the time. In many ways English no longer even felt like a foreign language to me. But now it became clear to me that what I’d never actually done before was try to write in English as a writer. My decade as a writer and editor for widely read magazines and newspapers had made me overconfident — they’d all taken place in my native tongue of Finnish. Now, I’d landed in the offices of this American magazine on a mid-career fellowship for foreign journalists and found myself staring at the computer screen with a pit in my stomach, discovering all over again what I already knew: that writing, that being a writer, requires far, far more than just fluency in a particular language. There was a deep cultural fluency that had to be mastered, too. As I sat at my assigned desk and tried to write up the simplest of reports — a news item about telecoms — the American college kids tapping away at their keyboards around me seemed oblivious to what it might feel like to have only learned the names AT&T, Verizon, and T-Mobile just a few days ago. It’s easy today to feel we know everything about other countries thanks to the Internet, ubiquitous global brands, and cheap flights. In reality, basic facts about life in another country, let alone insights one can write about, often remain completely invisible to us unless we actually try to start building a real life for ourselves there. Take a mundane but relevant example for the reporting I was supposed to be doing: American cell-phone plans. They were a complete mystery to me. In Finland I had never had to commit to a multiyear subscription to get what I wanted. Then there were the basics of American personal finance: I didn’t even know what it meant to “write a check,” since Finland had abandoned checks in favor of electronic payments long before I was even old enough to handle money. Heaven forbid I’d have to write about American tax codes or health care. Because of the experiences and perspectives we’ve acquired, we might have valuable things to say. Yet it is those same experiences that work to silence us. Luckily, the scope of my assignments at the magazine was limited, and mostly I managed to muddle through with the help of Google, the people I interviewed, and the admirable patience and generosity of my American colleagues. Once the fellowship ended, though, I was on my own, a freelance writer in America trying to figure out, all over again, how to do what I’d always done — write. I also had to figure out what, exactly, I might be able to write in particular, now that I’d been cut loose from the Nordic region of my expertise, and found myself adrift in an America that was alternately dazzling and bewildering. I cobbled together freelance assignments and lived my new American life, and in the process, discovered the peculiarities of that life imposing themselves on me more quickly and forcefully than I would have liked. I soon knew what it meant to fight your health-insurance company like an American, to wade through the insane swamp of American tax forms, to peer through the fine print of credit-card agreements searching for usurious hidden fees, and even to feel actual personal rage at a cable-TV provider. But I also learned many wonderful things: what it means to be part of an American extended family; what it’s like to actually get to know your neighbors on an American block; how good it feels to be welcomed and called a friend by some of the warmest, most generous, and outgoing people on earth. Inspired to understand my new home, I rekindled that old obsession with decoding Bon Jovi lyrics and set out to master the thousands of expressions and references big and small that constituted the shared American reality. Who was Horatio Alger? What are Skittles? How does a caucus work? What type of jelly does one eat with peanut butter? What are grits? What exactly happened with Nixon? What is the balance between the federal government and the states? Why do Americans keep referring to Finland and other Nordic countries as “socialist”? What does Boeing mean for Kansas? Who was Harriet Tubman, and what image am I to conjure in my head when Beyoncé sings of Becky with the good hair? To be an immigrant is a curious existence in all kinds of ways, but gradually I became preoccupied with one dilemma in particular. I’d been accumulating a reasonable amount of experience now in two very different realities — the Nordic and the American. It seemed to me that as a result, I — like all immigrants — might have something unique to offer. The dilemma, though, was that we immigrants often have difficulty finding our voices exactly because we are immigrants — people whose lives are split across different countries. In our new home we struggle to acquire the qualifications, skills, and language needed to put our knowledge to use. Back in our old home we are now seen as aliens, people who’ve left and don’t belong anymore, and thus who aren’t worth listening to. Because of the experiences and perspectives we’ve acquired, we might have valuable things to say. Yet it is those same experiences that work to silence us. But I didn’t want to be silenced. Not long ago I picked up the new book In Other Words by the award-winning Indian-American writer Jhumpa Lahiri. She describes her first trip to Italy, where she falls in love with the Italian language and yearns to speak it. For years she studies Italian while living in the U.S. and writing books in English, until finally she decides to move to Italy. She dedicates herself to collecting Italian words, reading in Italian, and eventually writing in Italian. In the end, she actually wrote In Other Words in Italian, even though her native tongues are American English and the Bengali that her mother had spoken at home. As we might expect from a Pulitzer-prize winning novelist who is admired for her precise sentences and compelling stories, Lahiri’s Italian book is so thoughtful and beautiful that it elevates the mundane battle of learning a new language into a philosophical effort to satisfy a profound yearning, and to transform a person’s internal world. I enjoyed reading it. But my own struggles of trying to write in a new language were very different. Writers, of course, are diverse, and our skills and goals vary. I have never been a literary writer, not even in Finnish. For me writing has always been terribly hard no matter the language. I’ll be honest: I hate writing. I do it anyway because I find reading and writing to be the best means to exchange ideas with other people. I’d like to write beautifully, but in the end language is a tool for me to express ideas, not an end in itself. Because of this, my effort to continue writing in English arose out of a practical need, as opposed to Lahiri’s romantic yearning. I did not long to write in English — I deemed it necessary to be able to discuss what leaving behind a Nordic country in the early 21st century, and immigrating to America, can impart to us that’s useful and important. Also, as someone whose native tongue is Finnish — a language spoken by very few people in the world — just the reach of English is intoxicating. After a lot of tortuous struggle over several years, I succeeded in writing a book in English. I’ve come a long, long way since those Bon Jovi lyrics, and a long way since feeling lost in the fog of living abroad in the offices of that American magazine. I’ll be forever grateful to the editors there for giving me the chance to have that experience, to write my first tentative words as a professional writer in English. Even after having written an entire book, though, writing in English remains slow and torturous, as if I’m piecing together an impossible puzzle, or constructing a tricky bridge across a perilous ravine. Meanwhile, I’ve discovered there’s one aspect of Jhumpa Lahiri’s experience of writing in a new language that I can actually relate to completely. It’s something she describes in In Other Words: the loss of independence. I suppose it’s ironic that in my book I write a lot about independence and how to achieve it. The actual process of writing the book, and trying to find my own voice, taught me that independence is a luxury that as a writer working in English, I no longer really have — at least when it comes to delivering polished prose to the world. Lahiri talks about her new dependence on native speakers of Italian; she needs them to help her revise her written Italian into an acceptable final form. The same is now true for me with native speakers of English, whose help I inevitably require. It’s humbling. On the other hand, maybe such dependence is a useful reminder that as lonely writers, finding our voice is ultimately in some way always a communal effort, regardless of the language. Having completed a book in English, I feel I’ve managed to avoid being silenced, and to say what I want to say. But where Lahiri comes across as the beautiful poet, I’m still very much the plodding technician. While she’s an artist, I belong to the working class. Maybe this is fine, and fitting — after all, Italy is known as the country of romance, whereas Finns often refer to their country as the land of engineers. I will never be able to compete in eloquence with people who’ve grown up with English, and who have more talent for prose than I do. Still, I’ve discovered that I can participate in the exchange of ideas. I can try to translate more than just language. I can try to translate life. Because I believe that learning about other people’s lives and different realities, sometimes across the barriers of language, is one of the most worthwhile tasks on earth. All one needs to get started is a dictionary. Eventually one might arrive at a book. 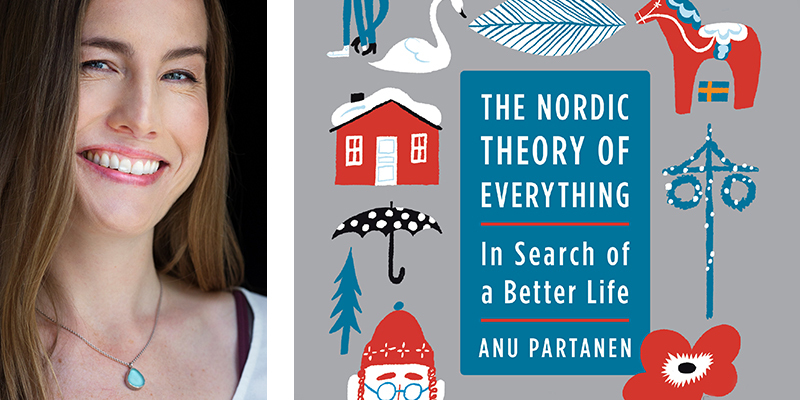 Anu Partanen is the author of The Nordic Theory of Everything. Her work has appeared in the New York Times and the Atlantic. A journalist in Helsinki for many years, she has also worked at Fortune magazine as a visiting reporter through the Innovation Journalism Fellowship at Stanford University. She lives in New York City.